WTOP is your source for regional news, traffic and weather in DC, Maryland and Virginia. 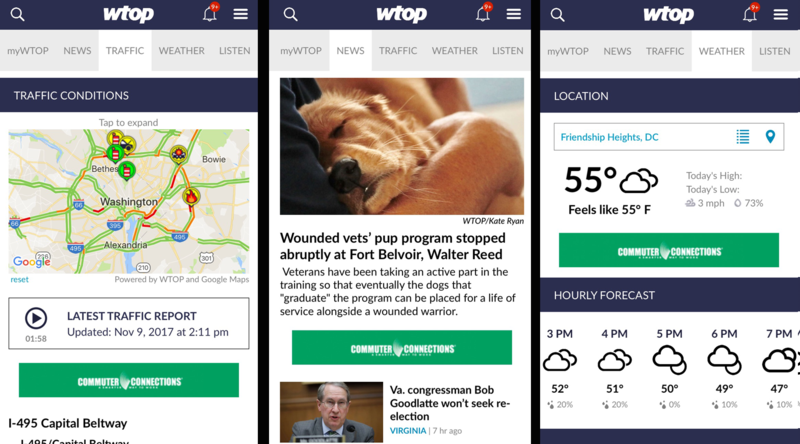 And we’re excited to bring you our new app, which offers a streamlined experience to quickly read articles, sign up for customized breaking news and traffic alerts, create a personalized newsfeed based on your interests, and listen live to WTOP Radio. Check out the features below and download today! Use myWTOP to create a personalized news feed. Select the topics you are interested in and WTOP will customize a list of articles just for you. Submit photos, video and audio through our “Report to WTOP” feature. Save and share important articles. Read exclusive stories from the award-winning staff of WTOP reporters. Listen live to WTOP Radio. Stream major press conferences and news events live. Subscribe to and download podcasts from the WTOP Podcast Center. Listen live to WTOP while browsing the rest of the app. 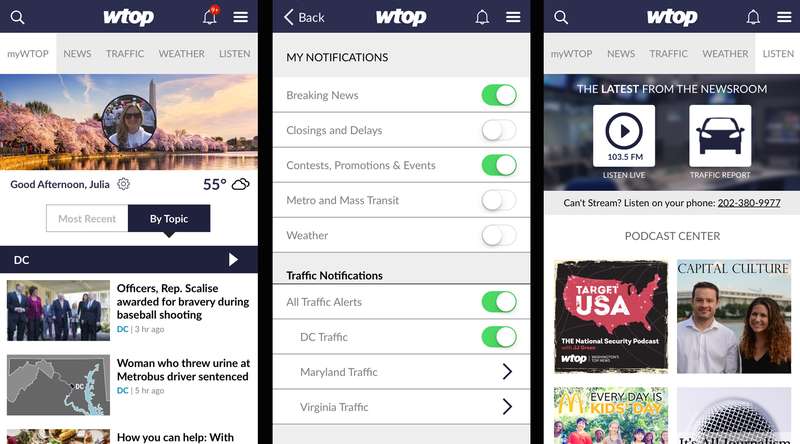 Sign up for “My Traffic” alerts to receive push notifications from the WTOP Traffic Center about incidents that will impact YOUR commute. My Traffic alerts are the most custom traffic alerts available in the Washington D.C. region. Report a traffic incident to WTOP via phone, Twitter, voice memo or email. Miss a traffic report on the radio? Our latest reports can be heard on-demand in the app. Where is traffic the worst? View our map powered by the WTOP Traffic Center and Google Maps. Taking Metro? We offer up-to-the-minute bus and train incidents and delays, as well as easy access to a Metro map. View the latest tweets from @WTOPtraffic. Bookmark your favorite locations for easy access to weather conditions. Closings and Delays information and alerts. Fast, streamlined and clean design created with you in mind. View photo galleries and videos with ease. Search for articles you hear on the radio as well as the top news of the day. Easily contact WTOP via phone or email.